Good news in the month of March…you don’t have to be Irish to celebrate St. Patrick’s Day, coming this week! Teachers in many communities outside of Ireland turn the best known symbols of “Paddy’s Day” into teaching tools for motivating students and building core skills – like writing. Set up a A Lucky Leprechaun Loves to Write! Bulletin Board in Your Classroom – Clear space on a large bulletin board in your room. Center a poster on the board that reads “A lucky leprechaun loves to write! Leave space around the poster to add student writing, including very Irish fun, funny limericks. 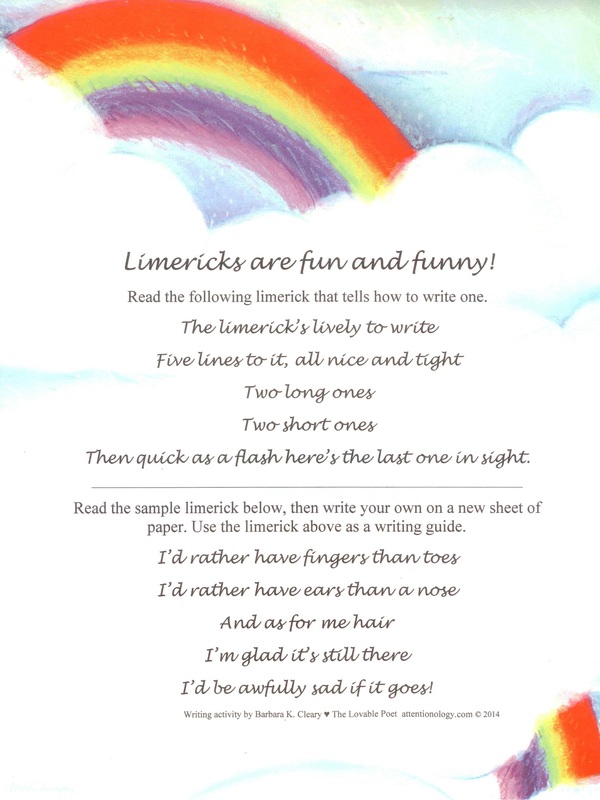 Limericks are lively to write! – Teach students the basic five-line structure poets use to write limericks. There’s nothin’ serious about a limerick. The Irish favor the fun, funny verses of limericks old and new! Then quick as a flash here’s the last one in sight. The first, second and fifth lines rhyme, as do the third and fourth lines with each other. Id’ be awfully sad if it goes! Post students’ limericks on your March attention-getting bulletin board. Kids love shape poems! 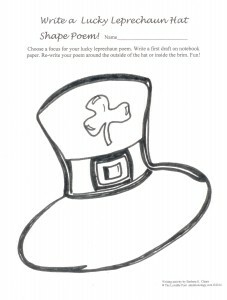 Invite them to write Lucky Leprechaun Hat Shape Poems that leave room around the outside of the hat and inside the brim for poetry. 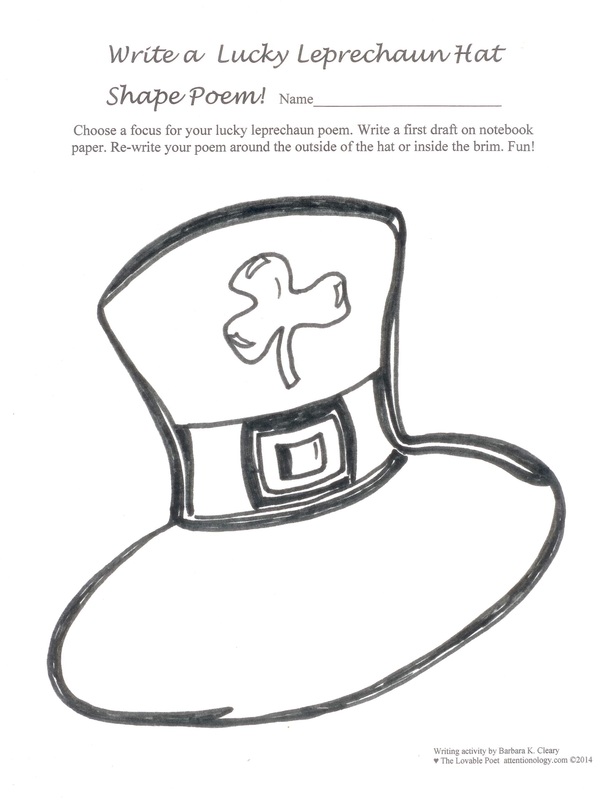 Write a Lucky Leprechaun Hat Shape Poem – Make copies of a “Lucky Leprechaun Hat” using my blog pic here or a hat from a St. Patrick’s Day card as a guide to draw a master. Distribute the copies and invite students to write Lucky Leprechaun Hat Shape Poems. Instruct kids to choose a focus for their poems and write a first draft on notebook paper. When they’re ready, ask the kids to re-write the finished poems around the outside of the hat or inside the brim. Post students’ shape poems on the A Lucky Leprechaun Loves to Write! Bulletin Board. Learning the Legend of the Leprechaun – Invite older elementary students to do some research into the history of leprechauns before asking them to write poems or stories based on the luck of the funny creatures. As your class will discover through research (or your own storytelling – you can use this post as a guide), the luck of a leprechaun is no luck at all…but rather the result of “good old-fashioned” hard work. Irish myths have long told a story that you may already know: Leprechauns are “believed” to be male fairies that take the form of little old men who live on the island of Ireland. As legend tells, leprechauns are very rich from constructing their many crafts. But, if one’s caught he must tell the truth about where his fortune lies. The leprechaun may be truthful but he’ll use his wit to protect his treasure. The legend of the leprechaun seems to have been used from one generation to the next as a story to model good behavior in children…follow the leprechaun’s lifestyle…work hard, be thrifty, tell the truth but protect the fruits of your labor. Write a Story with the Starter: The Harder I Work, the Luckier I Get! – Start brainstorming time by asking students if hard work really leads to good luck. Ask what type of work makes someone feel lucky. Note that each student will write a different story even though all of the titles are the same. Magic. 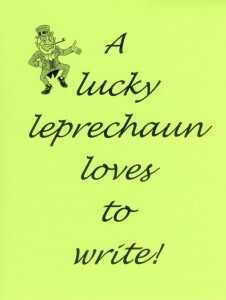 Post students’ stories on your A Lucky Leprechaun Loves to Write! Bulletin Board. Color a Magic Shamrock – Is any symbol more iconic of St. Patrick’s Day than the shamrock? Engage even the most reluctant writers with this easy and fun activity. No symbol is more Irish than the shamrock. 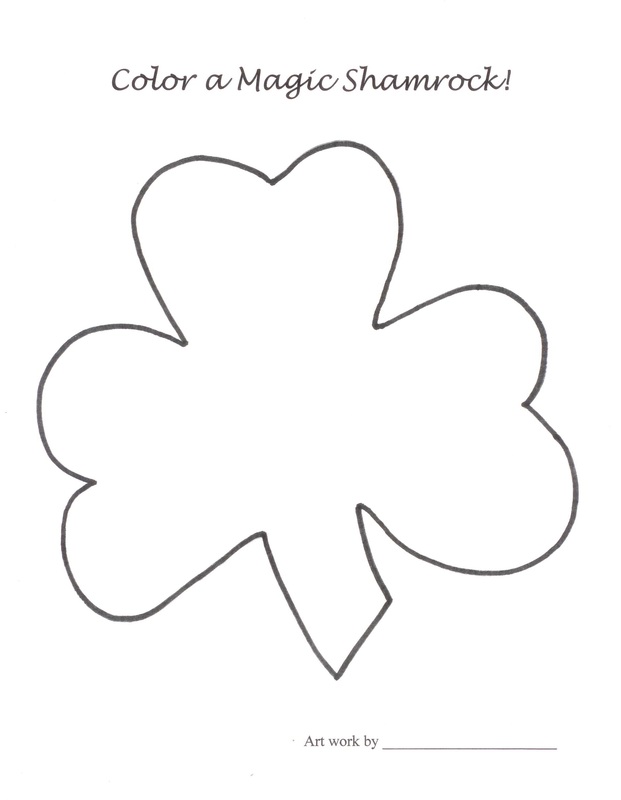 Give kids copies to “color a magic shamrock” for your bulletin board border. 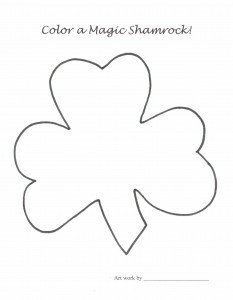 Make copies of a large shamrock on white paper (patterns are usually available in teacher supply stores and party supply stores). Distribute the shamrocks to students and tell them that they will make the shamrocks magic by coloring them and cutting them out. Encourage students to write short rhymes about shamrocks on the side they don’t color. Post the “magic shamrocks” around the border of your A Lucky Leprechaun Loves to Write! Bulletin Board. Invite students to read the poems and stories they’ve completed for this special celebration of St. Patrick’s Day and “the wearin’ o’ the green. Offering students a pot o’ golden writing and art activities that feature the luck o’ the Irish is a great way to catch and keep their attention for the entire month of March. Please send comments about how you celebrate March 17 with your students. Subscribe to www.attentionology.com for great teaching tricks at your fingertips. ‹ Move Over Basketball…Let’s Dribble IDEAS to Score Big in School!